Motivate all year long with an employee of the month award that truly shines. 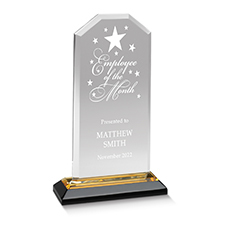 The Individual Star-Studded Award features a beveled gold-mirrored black base that reflects hints of gold through the elegant clear acrylic. Engrave up to 4 lines, 30 characters max/line.